Heat 3″ of oil in a deep fryer to 325 F. Alternately, heat 3-inches of oil in a deep pot. Peel the potatoes and cut them into chips, about the size of your index finger. Put the potatoes in the oil. Fry the chips for 2 to 3 minutes; they should not be crisp or fully cooked at this point. Remove the chips with a spider strainer or slotted spoon, to a paper towel-lined platter to drain. Crank the oil temperature up to 375 F. In a large mixing bowl, combine the flour, baking powder, salt, pepper, and egg. Pour in the beer and whisk to a smooth batter. Spread the rice flour on a plate. Dredge the fish pieces in the rice flour and then dip them into the batter, letting the excess drip off. Put the chips in the bottom of the fryer basket and carefully submerge in the hot oil. Carefully wave the battered fish into the bubbling oil before dropping them in on top of the chips. Fry the fish and chips for 4 to 5 minutes until crispy and brown. 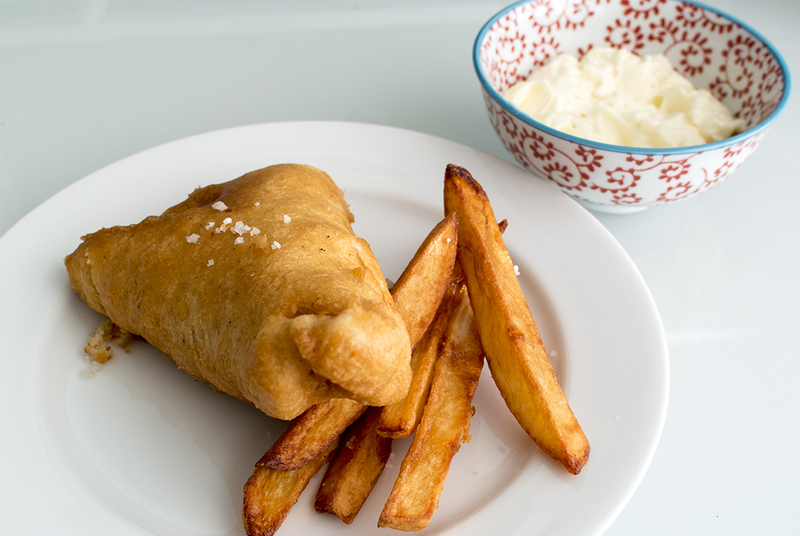 Remove the basket and drain the fish and chips on paper towels; season lightly with salt. A few notes on preparation: We used fresh cod fillets. The beer we used was Pabst Blue Ribbon (more commonly known as PBR). Amazingly, a success! We were somewhat dubious that our attempts would replicate what we’d had in the UK, but it was surprisingly similar. The batter was flavourful and crispy, and the cod had a wonderful, almost creamy texture. We did notice that the first time round, when we fried some of the potato with one of the battered fillets on top, it stuck to the chips. Thus, the second time around we tried just frying the fillet by itself, and we noticed that the batter was crispier and had the more iconic consistency on the first fillet. The chips were also super tasty–came out as good (or even better) than the fish itself. We also determined that just one russet potato would be sufficient to serve the two of us. Calling it a win! Note (5/9/15): After making it again, we decided that you really only need 8 oz filet for 2 people (leftovers don’t taste as good). There is also a lot of extra batter, so you can cut the amount in half.